Discussion in 'Assetto Corsa Competizione' started by GTPNewsWire, Jul 31, 2018. This article was published by Michael Leary (@Terronium-12) on July 31st, 2018 in the Assetto Corsa Competizione category. Pfei and adam thompson like this. Then most likely it will not come to consoles. Then most likely it will not come to this generation's consoles. lancia delta hf and letsdothis97 like this. It will come to next gen.
Whitestar, Jordanm and super_gt like this. Mirror_man and Grippy like this. How about give me ACC for my PS4 with a "graphics quality" slider, and I'll slide it to the left until I get acceptable performance and be happy? There are so many things that I need to spend $500-$1000 on before I spend it on a new PC (unthinkable) or console, so yea, I'm rooting for current gen. Anyhow, if they push to next gen, I'll have forgotten about it by the time it's a thing and it won't be a problem. The game overall is lacking in content. So as much as it is nice to have the game, it's only 10 tracks and maybe 10 car models. Wise thing to do would be to release a proper AC2 with Blancpain in it when the new consoles release, so you can be there cashing in and also get more exposure as a launch title. And it gives Kunos enough time to transfer all the cars and tracks to Unreal Engine 4. Jtheripper and Fredzy like this. If there's a similar release gap between PC and console like with the original AC I wonder if we'll end up seeing it on next gen consoles. Maybe a cross gen release. 50 cars (11 manufacturers) with 12 tracks is the 2018 calendar. Perfect numbers, frees up resources to focus on quality not content. CodeCmdr, CTstryk and East27 like this. I definitely see it out next holiday or summer. Because it will go up against forza Motorsport 8 and the lame project cars. So it’s an easy and exciting pic. Assetto corsa and forza. Definitely getting them for Xbox one. Digital download for sure. 100 bet to anyone here that it’s intended for consoles. 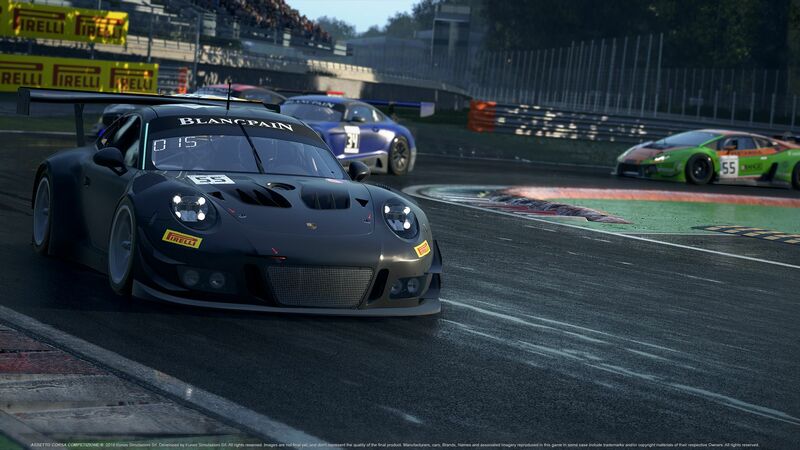 But because the PC version will be done weeks before the 2019 Blancpain series starts, they can’t commit to it within the terms of the license use. All automotive racing series licenses are annual. But an odd twist, if they are also doing the 2019 season, that has already been suggested a few times already, most recently in the press conference, they might “rush” the content update, then update the unreleased console version with the 2019 assets to get a full multi platform release earlier in the 2019 racing season. The trickiest part about that option is we already know most cars are getting a pretty major update, and there will be new tracks. So it isn’t a quick update unless they get an eRly start on it. dolande and WippyMan like this. I was having this debate on youtube recently with an AC superfan who was all offended because I said it was most certainly coming to consoles eventually....just a matter of when. For whatever reason this "PC master race" guy was hilariously defensive about it. Like, it won't diminish the PC version, it will still be the best one! Fanboys, what can you do? My point then is the same here....of course it will come to consoles. They know as well as anyone that the majority of gamers are on consoles. There is simply no reason to leave that money on the table. It's why they released AC on console eventually too. The only question with ACC is when. If I had to guess I would still say current-gen as I doubt we see PS5 or Next Xbox before 2020, but anyone's guess is as good as mine. One way or another this game will definitely come out on PS4/Xbox....this gen or the next. I look forward to it! Jtheripper, Whitestar, kingpen and 4 others like this. I was having this debate on youtube recently with an AC superfan who was all offended because I said it was most certainly coming to consoles eventually....just a matter of when. Just like Elite Dangerous got released on this gen, ACC will be released on the beginning of next gen.
Like I mentioned in another thread, the new owners of Kunos will most certainly want the revenue associated with a release on console in good time, they didn't buy Kunos to just target the niche market on PC. letsdothis97, Traks1, DonZmeuheu and 2 others like this. Well, after seeing ACC in action, its pretty obvious this isnt what we would expect from a next gen racer in terms of graphics. It could be up there with Forza 7 or GT Sport, but thats about it. In my view, it should be possible to port the game to the current gen of consoles. However, with Kunos history as a console developer, i guess it wont happening. With just 16 cars on track, no dynamic wheather or daytime, no xbox one x or ps4 pro support, Assetto Corsa never felt great on console. I guess Kunos are car enthusiasts and know how to build great car physics, but as game developers, they not exactly magicans. It seems they are pretty much unable to squeez all of the power from the consoles, which is fine however for a small indie team. They dont have the men power or experience of Turn 10, Playground or Polyphony. So yeah, its realistic to expect this game on next gen consoles, but i would like to play it sooner, and it should be possible on xbox one x for sure. It's not just about the graphics, which by all accounts are pretty OK on the PS4 Pro and XBox 1 X. It's the awful Jaguar processors that are used in these consoles that's the real bottleneck. If the physics engine in ACC is too heavy on the CPU then you could slide that graphics slider all the way down to wireframe and still not get an acceptable frame rate. letsdothis97, JakeMR2, Fredzy and 1 other person like this. The only full-fledged UE4 game on consoles at the moment is only Fortnite and with all features built-in/handled by the engine it still have minor framerate drops on base PS4 (Tekken 7 does not count since when in game the map is just small and not even big as circuits). With ACC, lets say they have UE4 base with AC's car physics/simulation engine embedded into one game. I 75% doubt the game will come to current consoles, but maybe nextgen consoles. And we dont know if ACC will have tech support straight from Sony/Microsoft. Most realistic solution at the moment is to buy a gaming PC or move into Gran Turismo (oops). Will not miss it when its not coming to the consoles. I bought the game because of Zandvoort but even on the X the graphics are hurting my eyes. I will stick with Forza and GT Sports, works fine for me as well. Will not miss it when its not coming to the consoles. I bought the game because of Zandvoort but even on the X the graphics are hurting my eyes. Well, that's because AC never got a patch for the Pro or the X. It's what you get on the base consoles. If ACC would come out for this generation of consoles then you can bet that they would have extra Pro and X patches to make it look nicer. Not exactly, F1 2015 had 2014 and 2015 seasons. If you read between the lines, it means that ACC is going to be a very realistic, complicated racing sim. Maybe too realistic for console, aka PS4 and Xbox One. That is because they are, this console generation the PS4 Pro and XBOX One X both have large cpu bottlenecks, they are the weakest link in both cases. Not saying it isnt possible to port and neither are they but they dont have the resources to be throwing people at many features at once. As similar as consoles are to x86 PCs these days there is still a lot of work that needs to be done in order to effectively utilize the hardware, its never as simple to as tuning of X and Y effect and capping off AI. They said the AC console port was mostly done by a single person for the most part, so its not as effective as it could have been. Hopefully the process is a little more easy with a third party engine for them, im had good success with unreal myself but nothing I have done is remotely close to the scale of a AA title such as ACC. Ultimately its programming with a different mindset, on pc you have a higher ceiling, on console its fixed(or tiered these days). lancia delta hf and th3o like this. Totally agree. As good of a value for money the current gen consoles are, but when it comes to the CPU, that Jaguar architecture is basically a mobile CPU. It's widely known that it's a low ceiling for games with more physics complexity and calculations of many moving objects. Yea I keep hearing this. I guess we'll see. Between the new game engine and additional team resources I'd expect something if at all possible. As gladbecker mentioned, squeezing ACC (which most kiddos these days would call a demo compared to a full AC/GT/Forza game) onto current gen, making way for AC2 to launch on next gen would be a stellar financial decision.